When cleaning out my pantry the other day, I discovered an unused can of Libby's Pumpkin filling. I thought about making mini pumpkin pies or even pumpkin cheesecake. But just thinking about heavy dessert made me feel like I had just eaten Thankgiving dinner! 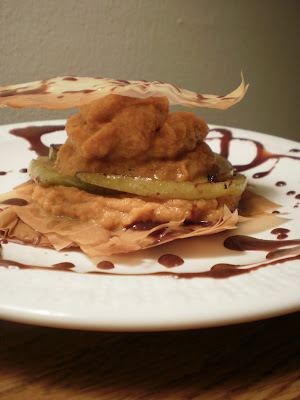 So I thought I'd use the pumpkin in a simple, light dessert! Mix all the ingredients for the filling into a bowl. Set aside. 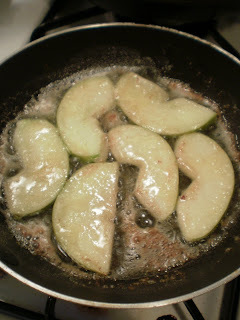 Cook some granny smith apple slices in butter and cinnamon for about 6 minutes until they are nice and tender. I left the skin on because I liked the green contrast with the orange pumpkin... yum. The phyllo dough I had in my freezer was just enough to make a few squares for my crispy sandwhich. Cut the phyllo into 3' by 3' sqaures and sprayed each layer with cooking spray. Layer them so they would just get crispy and not burnt and bake them at 350 degrees for about 7 minutes. In a double boiler, heat the choclate until it is melted. Heat the milk until it boils and mix chocolate and hot milk into a seperate bowl. After it is mixed, add the confectioners sugar and the choclate drizzle should be, well, drizzly. Making the sandwhich is easy! 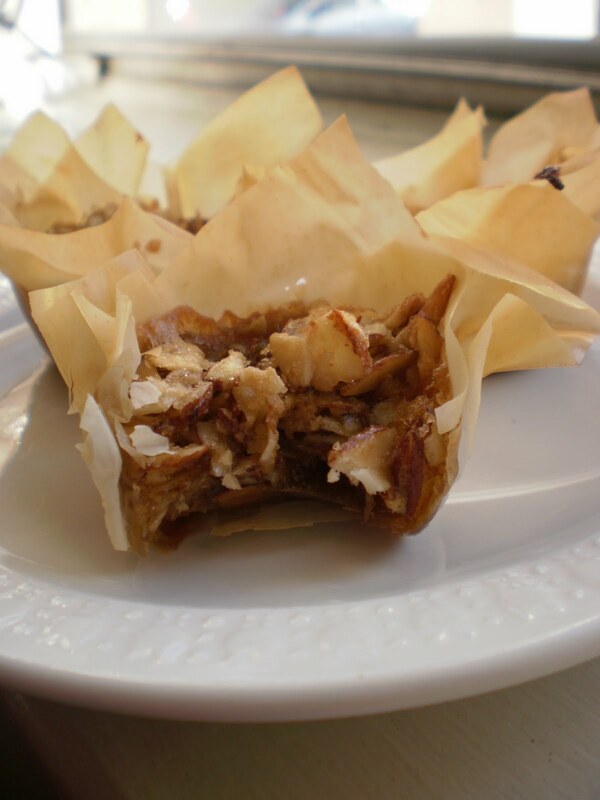 Spead a thin layer of the pumpkin mix onto the bottum layer of the phyllo crisp. 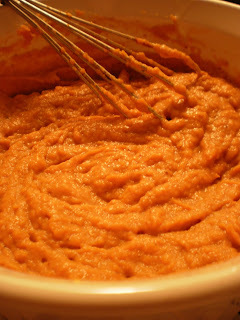 Layer some cooked apples onto it and then place a big dallop of the pumpkin mix on top of the apples. Then place the top crisp on the pumpkin. 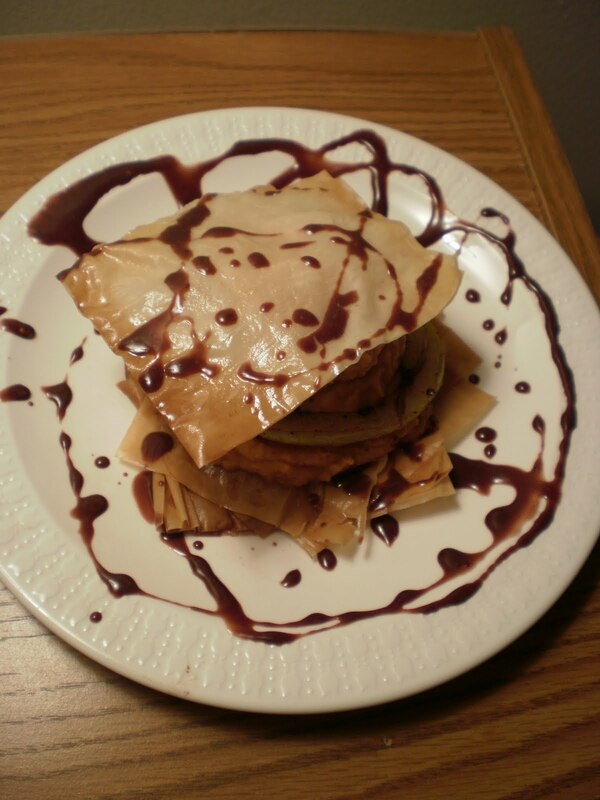 Drizzle your chocolate and enjoy! This sandwhich is simple and seasonal. When the boyfriend and myself sat down to have a taste, it was better than I expected! It had everything that makes dessert delicious. It was crisp, sweet, savory, and the tartness of the apples added just the right amount of complexity to it. It was plate-licking good. 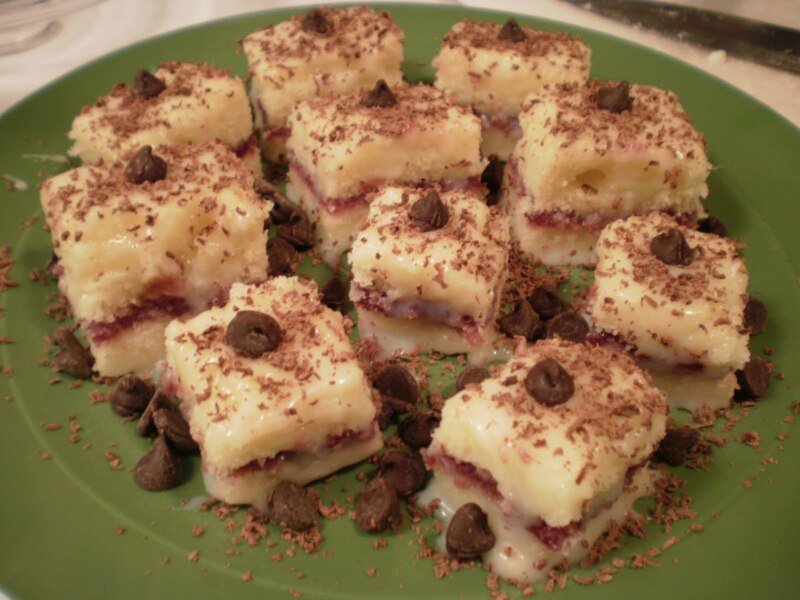 If your looking for a light but seasonal dessert for thanksgiving, try this! You won't be dissapointed. 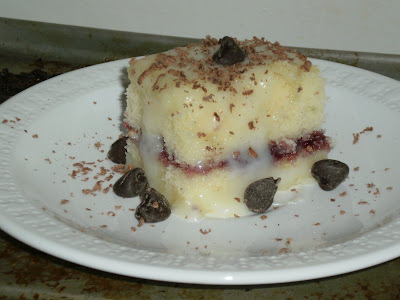 The recipe started out perfect: vanilla cake, raspberry jam for the filling, melted white chocolate and cream frosting; perfect. 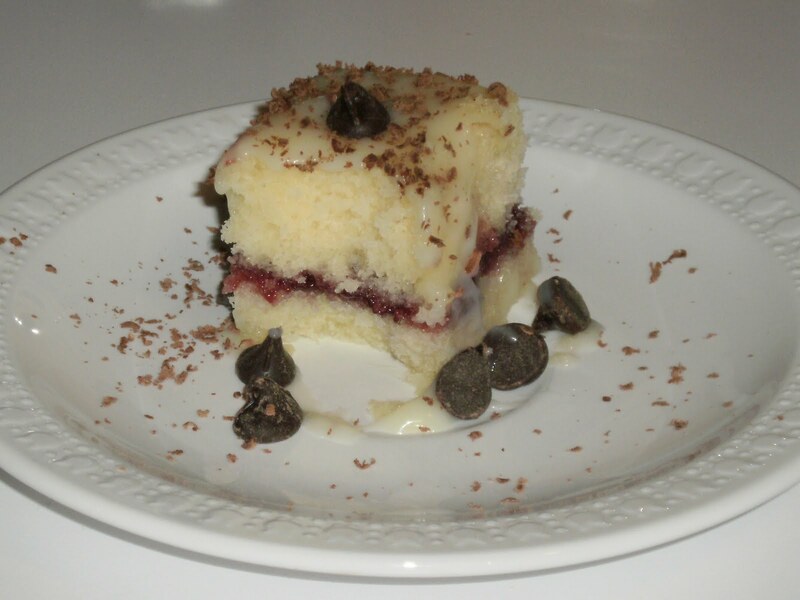 The cake turned out moist and tasty! I even painstakingly strained the raspberry seeds out of a whole jar of raspberry jam with my tiny strainer... everything was going well! I magically was able to cut the top of the cake off, smear the filling in, and put the top back on without any sort of breakage. The trouble came when I started cutting the petits fours themselves. My knife wasn't that great and the cake kept sticking! Everytime I cut a square, it just looked sloppy. "No worries! I have frosting!" Yea, I had frosting alright, but my eagerness got the best of me. 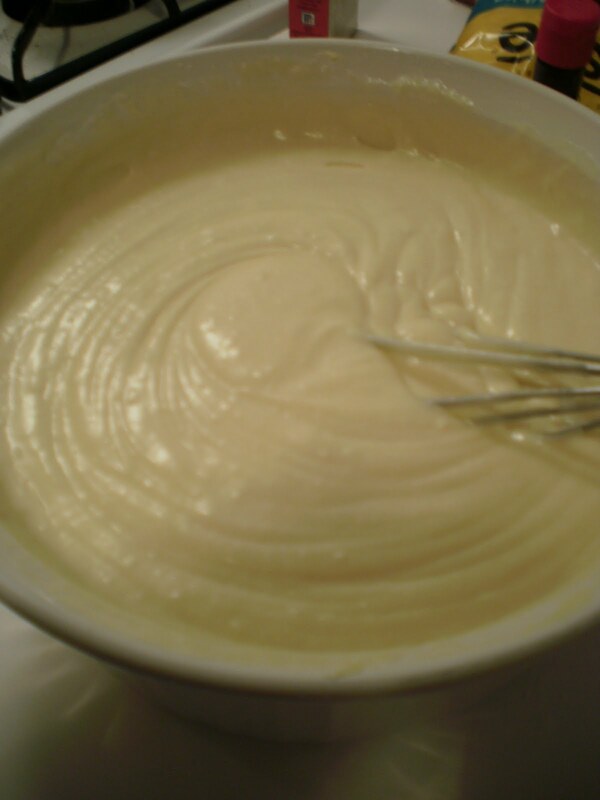 The frosting was simple: 1/3 cup of heated cream into a bowl of 12 OZ of white chocolate chips. But the one big mistake I made was slopping on the frosting way before it cooled! When I started putting the frosting on I was dissapointed because it literally soaked into my beautiful cake that I worked so hard on!! (sigh) But the petits fours still turned out delicious and my brother (who usually hates cake) requested I make him more for his birthday which is coming up soon. Even though they were really delicious, I was still dissapointed! Have you ever worked REALLY hard to make something awesome and it didn't turn out? Where you as dissapointed as me? 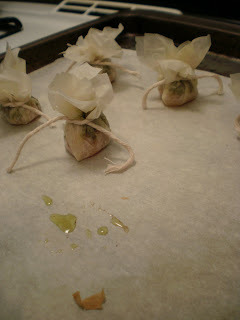 I dunno about any of you, but I rarely think about buying phyllo dough at the store. 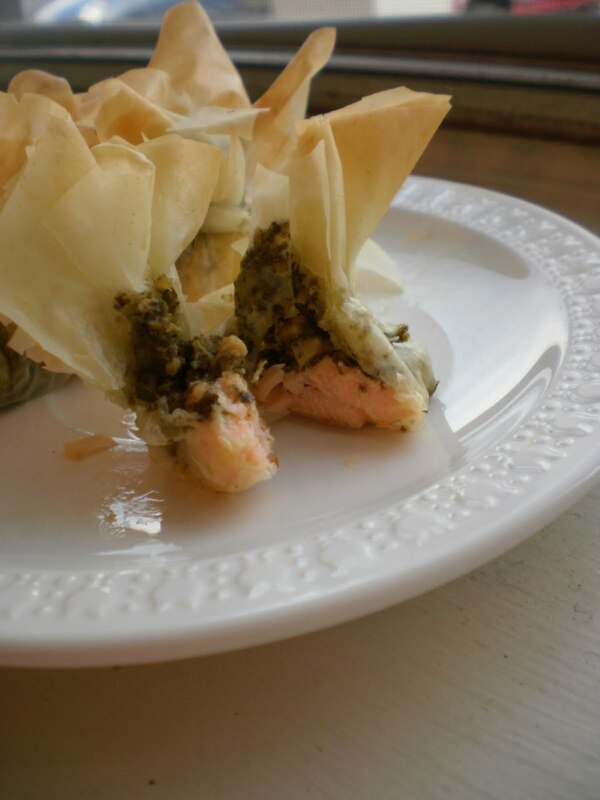 I recently saw this recipe with salmon and pesto wrapped in puff pastry. I wanted to try it but I opted for phyllo dough instead because it's so much lighter and it gets intensely crispy! This was REALLY easy to do. 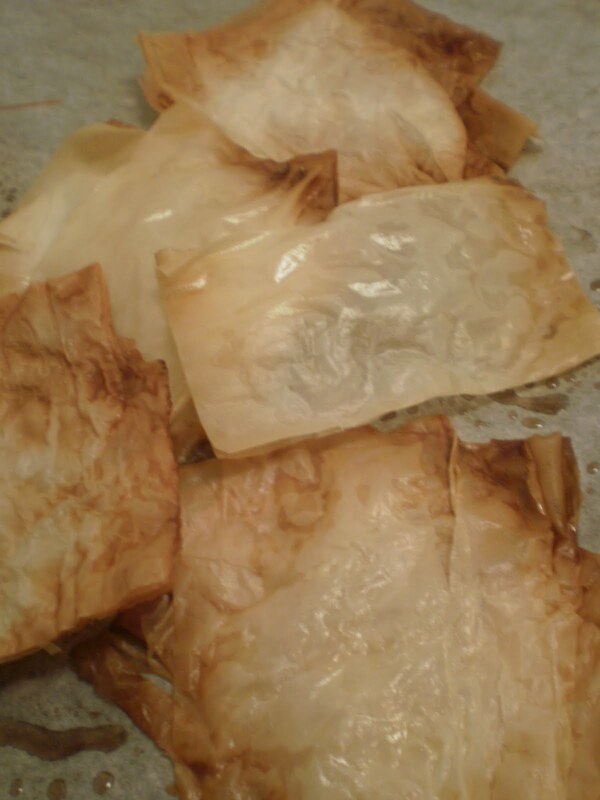 I cut the phyllo into 2' by 2' squares and sprayed about 2 layers of phyllo with baking spray. 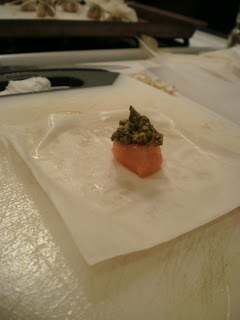 Then I placed a cube of salmon and alittle bit of pesto on top. I folded the corners upward and tied the whole cube together to create a bite size salmon purse! The hardest part about this recipe is tying the string on but seriously, it's worth it because they turned out so pretty and yummy. I baked the little bites for about 10 minutes at 375 degrees. The salmon was buttery and the phyllo was crispy. Oh, it was heaven. ALMONDS! 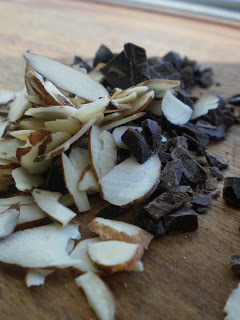 Yummy, slivered almonds, already chopped! 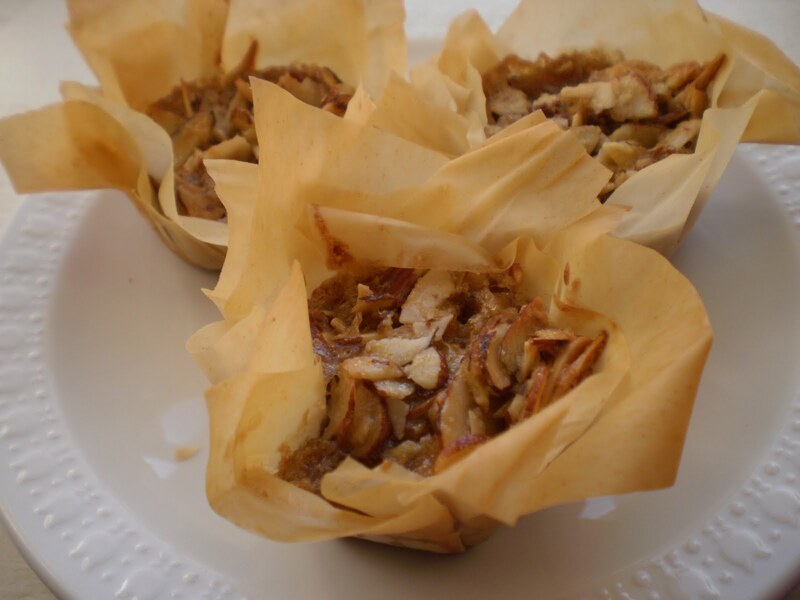 Almonds have great flavor and bake well, so I decided to make mini almond pies. 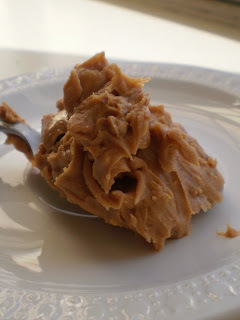 I just mixed together half a bag of silvered almonds, 1 egg, 1/2 cup brown sugar, 2 tablespoon granulated sugar, 1/2 teaspoon of cinnamon, and 1 teaspoon vanilla extract. 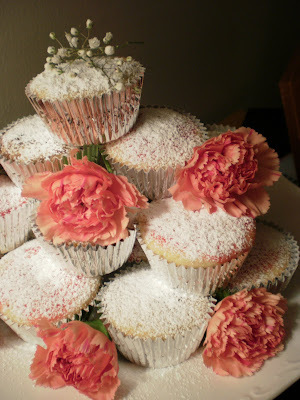 I used the mini cupcake tins that I am still borrowing from my mom. :) I stuffed two sheets of 2' by 2' squares into the tins, loaded the almond mixture in and baked at 350 degree's for about 15 minutes. Oh my, they turned out so light and crispy and yet they were delicious and satisfying. My parents requested I make these for the Christmas party! 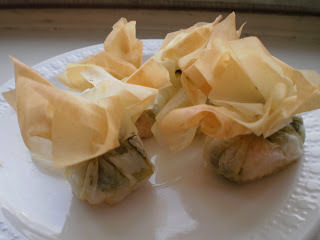 Not only are they light and yummy, but they are also really pretty and elegant! I mean you can pretty much stuff anything into phyllo (okay not anything but you get the idea) and it will turn out light, crispy, and beautiful! Using this box of phyllo has given me so many other ideas too. You can make those phyllo purses with just about anything. It's so versatile, I'm glad I tried it! 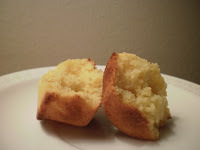 The very first post I had on my blog was about a boxed mix for corn bread. Don't get me wrong, Jiffy corn bread is delicious but when you make it all yourself, it somehow tastes better! Making the corn bread myself was literally just as easy as using the box mix! Do you work in a bakery or pastry shop? What is your favorite or least favorite part? So, Obviously if you're reading this, you've realized that I changed the name of the blog and the colors! I'm very excited. 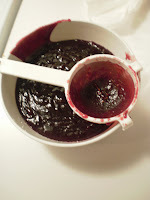 I thought Kitchen Kitten poorly relfected what I was trying to do on my blog, which is bake! 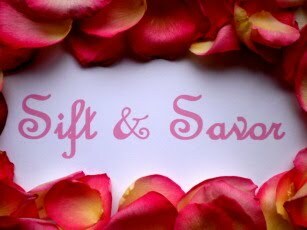 As many of you know, someday I'd like to have a career in baking and pastry so I think "Sift & Savor" is a perfect name! I adore it and I hope you will too! Also, I have big news! Recently I recieved great advice to get an internship or an unpaid position to get experience in a bakery setting. 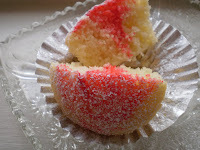 Well ,last week I had an interview with Annie B's Confections, which is located in Newtown, PA. They gave me an internship! Yesterday was my first day and I was thrilled to be there. I've learned alot already and I love it! I'll keep you updated on the whole experience. 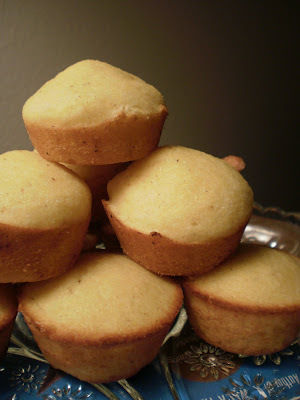 Next Post: Home-made corn bread with a twist! When your cookie dough is mixed, grease a pan. Using a spoon, place about 2 tablespoons worth of dough onto the baking sheet and place them about an inch apart. The cookies won't spread out too much but give them room so they don't touch. 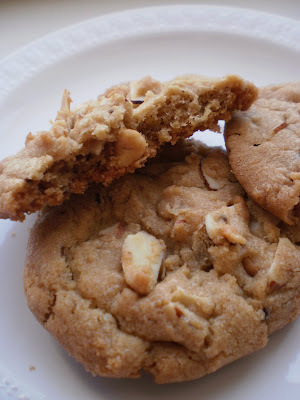 Bake them for about 10-12 minutes or until the bottom of the cookies are browned. 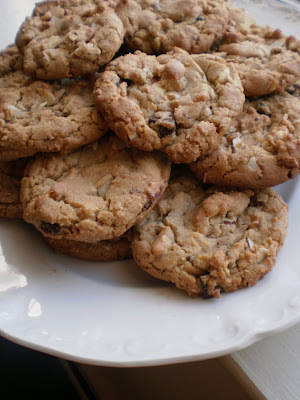 These cookies are really delicious and are the yummy-est when eaten right out of the oven-nice and warm! Mmmmm. Enjoy! 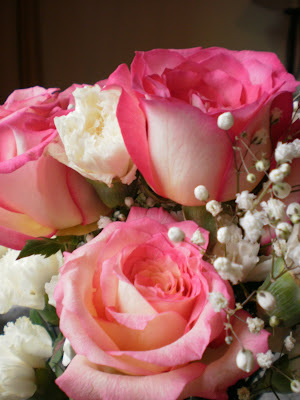 I was in a very girly mood when I woke up this morning and decided that I HAD to have some flowers. When I walked into my local flower shop, they just happened to be having a sale on just about everything(don't you love when that happens)! I stumbled upon these gorgeous pink roses for three bucks and decided they were a must! Then I happened to spot some colorful carnations to the left of me that had swirls of pink and white. 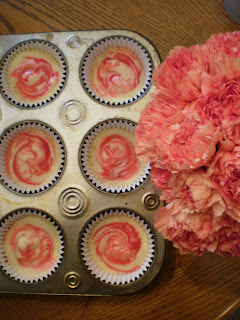 As soon as I saw the swirl carnations, I immediatly thought of swirl cupcakes-no joke. So I got in my car and bought food coloring! 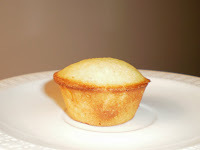 I made a basic vanilla cupcake recipe and filled cupcake tins. 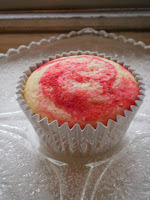 Then I put one drop of red food coloring onto the tops of the cupcake batter and swirled in the color. It came out so adorable! This is so easy to do and you can do it in many different colors too. Blue, green, red, orange, pink, purple-you can mix the food coloring to make colors like "teal" and "sunset". That's what the box said anyway. But I stuck with pink! The swirl of coloring even goes down into the cupcakes, not just on top. It looked so cute and they tasted really delicious. 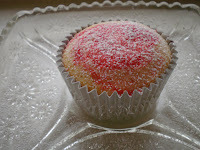 I never appreciate an un-iced cupcake until today and to tell you the truth, I much prefer cupcakes without the icing! Especially if they are moist. I decided to dust mine with sugar. And then I went so far as to make a cupcake tower. I added my flowers and some baby's breath on top just to make it extra pretty. So cute! Next time I have people over and I'm cooking dinner, I am definitely making this simple cupcake tower. It's easy but it looks so elegant with the flowers. Never has cupcake baking been so fun! A 21 year old food enthusiast exploring the world of baking and pastry.